we're currently making a series of hand made books at Marlhill Court, Offerton, Stockport. Working on the theme of 'pleasure' Participants in the project range in ages 65 to 97. 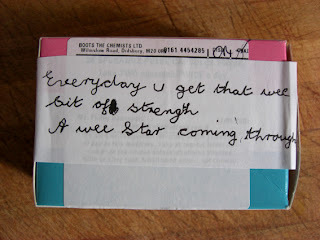 The collection of artists’ books, will be on exhibition at Manchester Central Library and other venues tbc. later this year. Last week we made a book from one of my grandma's card packs, with a poem about the joy of games and illicit pleasures The week before we investigated issues surrounding medicine taking, from the sensation of taking a pill to the fear of taking to many (or to few) We also discussed their recipes for fitness and wellbeing, these ‘tips’ where mixed with the medicine taking to create poems. 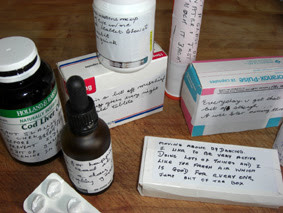 We ‘adapted’ pill containers, with stickers hand written with their work. Other books have been made with lolly sticks, with autumn leaves, old cassette tape boxes, office rolls, and with folded paper. Some really beautiful thought provoking hand made books are being made.